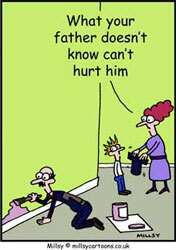 Summary: Learn how to install a door stop. 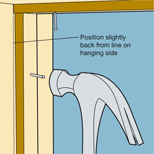 A doorstop is used to prevent a door from swinging open. When first nailing the lengths of doorstop to the door lining, only knock them in enough to hold the doorstop in place so as to allow for alterations to be made later. 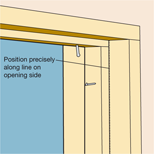 Close the door and draw a line around the door lining where the door meets it. Cut a length of doorstop to fit across the door head inside the door lining. Position it on the guideline and nail it into place with three nails. Cut two more lengths of doorstop for the hinge side and the opening side of the door lining. 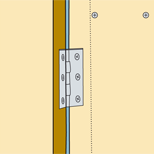 Fix the doorstop to the hinge side of the lining first, nailing it slightly back from the guideline. Position the doorstop on the other side of the lining exactly over the guideline, and nail it in place. Check the door operates smoothly before knocking all the nails in permanently. Draw a line around the door lining where the door meets it. Fix the doorstop to the hinge side first, nailing it slightly back from the guideline. Position the doorstop on the other side of the lining exactly over the guideline.